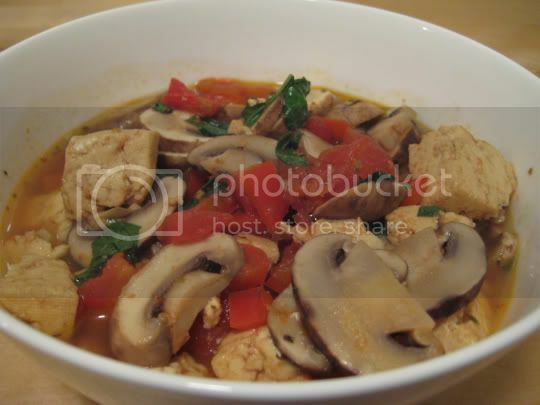 I thought this would be good: a nice, thick, fragrant stew-like dish with tofu, tangy tomatoes, sweet basil, and earthy mushrooms, all in a winey-based broth. But instead, this was a drunken concotion of mushrooms and mushy tofu. The abundance of mushrooms was overkill, and the tofu (which was not sauteed and browned as it should have been before adding to the stew) broke up and turned into pieces every time I stirred the pot. And the marsala, wow TWO CUPS of this stuff. It did smell good as it cooked in a wino sort of way, but I had to back my head away from the steam in order not to risk becoming a little buzzed. The dish also started off too salty, but the tomatoes and Marsala calmed that down some. I don't know, maybe the alcohol in the Marsala didn't cook off enough, but I couldn't cook it too long or the tofu would completely fall apart. This recipe was just all over the place, and not in a good way. Make again? No. The concept was great, but it definitely didn't work for me in the end.